There are seven billion people in this world and only 1.2 billion computers — but close to six billion cellphones. That makes the commercialization ability and growth potential for the mobile Internet massively greater than that of the PC-based Internet. China, the world’s biggest Internet market, recently surpassed the U.S. in smartphone activation, and the mobile browser is once again coming to the forefront. Here’s why. In emerging markets such as China and India, the world’s two most populous countries, the mobile browser is a critical channel that connects people to the Internet in ways that the PC browser never did. For many people, it is their only connection point to the Internet — take Indonesia, for example, where linking its thousands of islands by a fixed nationwide network was prohibitively expensive, so they prioritized the build-out of a mobile network. Since cellphones are much cheaper than computers, and the mobile Internet is much more accessible than fixed-line Internet in emerging markets, users purchase their first cellphones much earlier than their first computers, which sets user habits to surf the Web through cellphones. 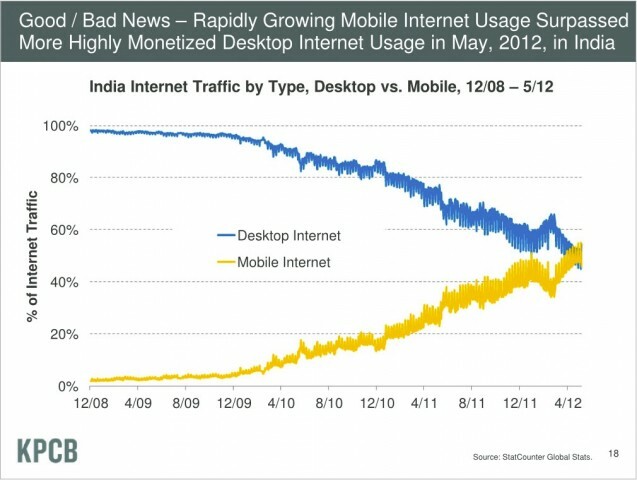 In fact, Internet traffic flow on mobile devices surpassed that of the PC in India in May of this year, and the number of mobile Internet users overtook that of the PC in China just a month later. In addition to user habit, technological advancement has contributed to the widespread use of the mobile Internet. For example, cloud computing has made mobile browsing work where bandwidth and mobile devices’ computing power are lacking. Before, in many parts of the world, browsing the Web through a cellphone with its native browser was extremely inconvenient and slow. Opening a Web page took almost a minute — intolerable to most users, particularly those accustomed to surfing on a PC. It was also ridiculously expensive. For example, opening a 2MB Web page in China (the typical size of a homepage for popular Chinese Internet portals), would cost 60 RMB, or almost $10. With cloud computing, data can be compressed by 80 percent or more, offering much faster and affordable Web surfing. With the bandwidth issue easing and mobile devices becoming more capable, the cloud computing technology approach makes mobile browsing accessible to a much larger worldwide population, and gives users an overall improved mobile Internet experience. Security. This is a serious issue on cellphones. Installing an app means opening up a myriad of ports, which is like punching holes in a wall. Cellphones are closely connected to a user’s identity and financial information, which attracts thieves. The browser has been created with a high level of security; the browser sandboxes the Web apps running on it, hence providing an extra level of security over apps. Service. What users really want is the functionality that an app provides — not the app itself. With the Internet browser becoming more capable, Flash-based games can run on a browser, as can videos. For a long time, people used dedicated video software, but with YouTube, people have become accustomed to watching videos on a browser — and may not need a video player at all. The apps are still there, of course, but they’re morphing into Web apps. By nature, the browser is a user’s access point to the Internet. Software companies such as Netscape and Microsoft went against nature by developing products as isolated pieces of software. Both Apple and Google are innovation leaders in the Internet industry, and serve as great examples for newcomers. The lesson learned from Netscape and Microsoft is that we should not view the browser simply as a single software tool; instead, it should be treated as an Internet service platform. Google knows this with its platform, and tries to fulfill the needs of vastly different users by enabling them to customize their browsers with plugins and Web apps. Users turn to the browser for three reasons: Information gathering, entertainment and daily life enhancement. The capabilities browser companies provide must match those service areas, like personalized navigation. Smart technologies can now adjust picture and text size, provide voice control, offer different reading modes or change delivery priorities based on the network environment. Browser companies gain customers and market share with industry-leading performance, but that is far from enough to build a service platform. To build a global ecosystem of users, there also needs to be a strong business-building component, like account management and billing services, or platforms developed specifically for game use. Dedicated operations teams need to conduct research in market dynamics and actively monitor user feedback to drive timely updates that satisfy the ever-changing needs of users. Only by focusing on the diverse needs of users wherever they reside can we fully realize the value of the Internet browser. The time is now for the tech industry to take more of a global view of what that means. Yongfu Yu is the chairman and CEO of UCWeb, whose mission is to provide a better mobile Internet experience to billions of users around the world. Earlier in his career, he was a VP at Legend Capital. Yu graduated from Nankai University in 1999 with a bachelor’s degree in economics and minor in computer science.